Prompted by a conversation in my comments box, I thought I would explain more about beeswax polish. The polish I make is made from just 2 ingredients, pure beeswax and pure turpentine. There are a couple of stages in the manufacturing process to ensure the final polish is smooth and creamy, but then these are my secrets. Natural turpentine comes from distilled tree sap. This carries the beeswax and feeds the wood. The result is that the beeswax works deep into the wood and gives it a deep sheen, rather than a surface buff. 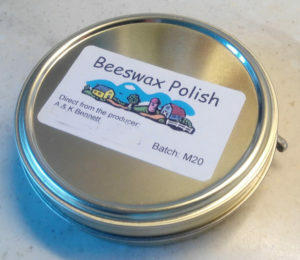 There are cheap versions of beeswax polish out there, but be aware and check the ingredients, as many add cheaper ingredients to bulk up the product. They can substitute some of the beeswax for cheaper waxes (eg 50% beeswax, 50% cheap wax) and they will use artificial turpentine. This is a man made solvent, often white spirit based. The problem here is that instead of feeding the wood and helping to take the wax down into the wood, giving it a deep sheen, it evaporates quickly. This means that the wax is left sitting on the surface and so is harder to rub in. The artificial solvent also pulls the natural oils out of the wood, actually drying it out, the opposite of what you want. Putting it simply. If you care for your furniture enough to want to use beeswax polish, then do make sure it is the real genuine product, not a cheap substitute. I don’t make much, so it isn’t generally listed in my shop, but I do have it available for £4:50 a tin (approx 80g) plus postage of £3:50. I can also add it in with honey sales to share the postage. Send me a message if you are interested. Very informative, thanks Andy. I’ve emailed you separately hoping to buy 6 tins as I think that should come in at the under 1kg Royal Mail psotage weight? I’m going to be supplying others in my woodworking group!